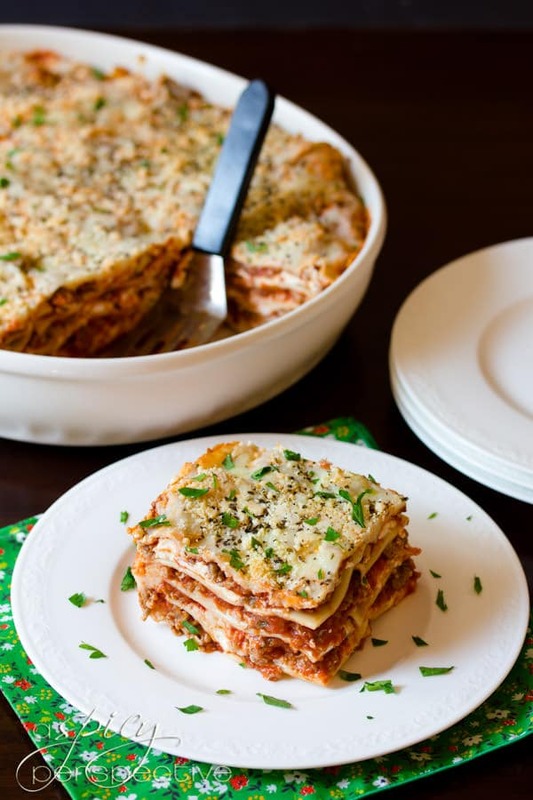 You just can’t beat homemade lasagna layered with piles of noodles, meat, and cheese. This rich and zesty sausage lasagna is a family tradition with a surprise ingredient no one can resist! I love the way that word rolls off the tongue. Nothing but warm fuzzy feelings could possibly fill your heart, upon hearing there’s going to be lasagna for dinner. 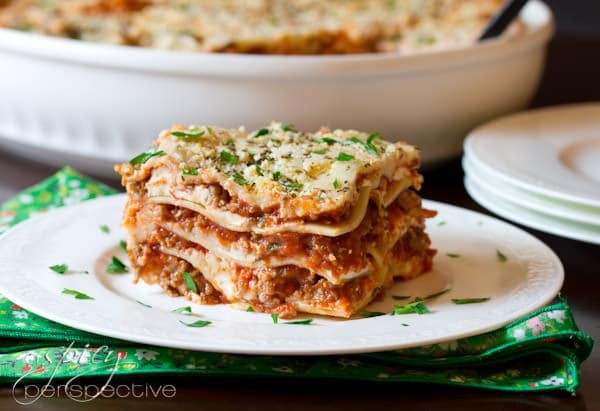 Homemade lasagna has been a family favorite on both sides of our family for years. But I’ll never forget the first time I made it with a life-altering ingredient. Right after Lt. Dan and I got married, we went to Indiana to visit his family. In an effort to make myself useful (and endearing) to my new mother-in-law, I offered to help prepare dinner every chance I got. Dan’s mom Sue, is an exceptional cook and I only hoped I wouldn’t do something silly and embarrass myself. One evening, homemade lasagna was on the menu. 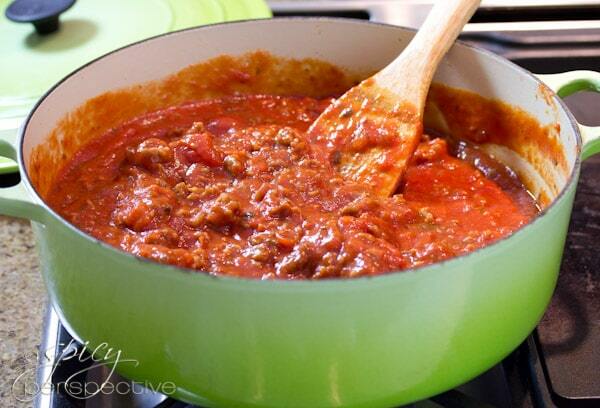 We prepared a thick hearty meat sauce and let it gently simmer on the stove top. We boiled the noodles and laid them on clean tea towels. When it was time to assemble the lasagna, I looked in the fridge for the necessary cheeses but could not find ricotta. Sue informed me that their family didn’t use ricotta cheese in homemade lasagna. Cream cheese in sausage lasagna? I couldn’t imagine lasagna without ricotta. That is, until I tasted it. A Flavor Tidal Wave of Epic Proportion. Once you’ve added cream cheese to homemade lasagna, there is no turning back to ricotta. This homemade lasagna recipe is essentially my mother-in-law’s recipe with three heaping layers of noodles, thick sausage-based meat sauce, and a 3 cheese blend. Sue taught me to mix mozzarella, parmesan, and silky cream cheese to create the perfect combination of salty goodness, and creamy texture. This is a magnificent sausage lasagna recipe. Traditional Sausage Lasagna with Cream Cheese. Preheat oven to 375 degrees F. In a large sauce pan, brown the sausage over medium heat, breaking into small pieces with a wooden spoon. Once the meat is fully cooked, add the marinara and simmer for 10 minutes. Boil the noodles in a large pot of salty water, according to package instructions. Remove the noodles and lay them out on a clean dish towel. Start assembling the lasagna: One large scoop of meat sauce on the bottom, 3-4 noodles across (cream cheese side up), 1/3 of the mozzarella and parmesan. Repeat. After the third layer of noodles with cream cheese, pour the rest of the sauce over the noodles before adding the last layer of the mozzarella and parmesan. Sprinkle the top with Italian Seasoning. Bake uncovered for 20-30 minutes—until the cheese is toasty and the sides are bubbling. Wait at least 10 minutes before cutting. Lasagna (as well as many other favorite pasta dishes) is considered better the second day. If making this ahead, Cover well, refrigerate, and bake for 40-50 minutes to heat through! 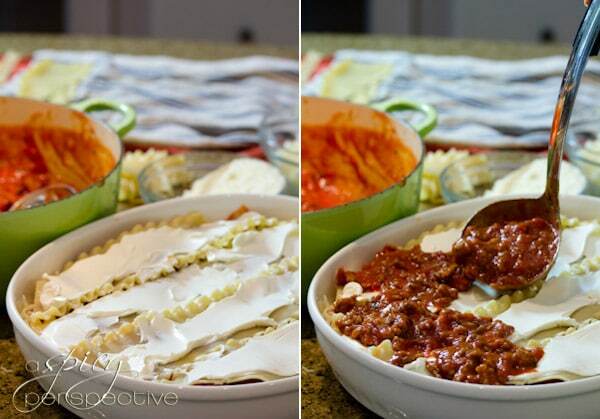 I can never make a lasagna again without using cream cheese…MIND BLOWING! This is the only lasagna recipe I use. I am a father of 3 and Step Dad of 3 ages 9 to 19, all of which are athletes. We have to double most recipes to make enough food for 8. This is a tricky task because if the kids don’t like it my wife and I have leftovers for days and days. I made this lasagna yesterday and let it sit on for a few hours before baking. We had 2 boys at baseball, 2 girls at volleyball, 1 girl coaching volleyball, Mom watching volleyball and I took the 9 year old to shoot hoops after the lasagna was done being prepped. I served the dish with my secret homemade garlic cheese bread and guess what? The lasagna got crushed! It was plenty of food and 4 of the kids had seconds. The 19 year old picked out the cream cheese difference right away. The only thing I changed was using 1 lb mild and 1 lb hot Italian sausage to give it a touch more complexity. This will be the go to lasagna recipe from now on. What a great idea your MIL had! From the real life Brady Bunch. Summer, where is the homemade marinara sauce recipe? I couldn’t find it. Ron. Can you cook this is a crock pot? If so how long? Forgive me for asking…there aren’t any seasonings listed besides italian seasoning. Most other recipes have oregano, basil and garlic, etc. I’m a retired military guy so I’m not a culinary wiz. Hi John, I just meant for you to use the herb blend “Italian Seasoning” you can find at most grocery stores. It’s usually a mix of oregano, basil, rosemary, and marjoram. You are the woman!!! I made it this weekend and it turned out great! I made a few errors but the final results were phenominal. I cooked the noodles too long and had to microwave the cream cheese to get it softer but it came out perfect. Thank you. Have you ever tried freezing this and then baking it? If so how would you alter the directions? I love this! I love lasagna but I HATE ricotta cheese. I’ve tried to use fresh mozzarella or parmesan before but the moisture was off and so the noodles dried out. This is perfect. Making this tonight. My mom always swore by cream cheese in mashed potatoes. I love cream cheese but I never did get around to that one. It’s okay. I kind of like my mashed potatoes tasting kind of like potatoes. What size box of lasagna noodles do I get? Cream cheese? Sheer luscious brilliance. THIS LASAGNA IS AMAZING! I only made half of it to begin, because I was not sure how it would turn out. My family INHALED IT and were looking around like, “Is that all?! ?” They have been asking me to make this again, and I will do so this week. I know this is super old but hopefully someone will come across this comment & have an answer for me……will replacing the sausage with ground beef change anything? I want to make this for my toddler & I’m breastfeeding so I’m worried may be a little to spicy for my babies. Also, I’m wanting to sneak in some veggies (zucchini, squash, etc…your usual lasagna veggies). Will I need to alter cook time, temp, or anything else if I make these adjustments? Hi Meagan, Swap away! Of course it will lose a little flavor, but will still taste wonderful. I would add some extra Italian seasoning to the ground meat and maybe some garlic. That should pump up the flavour. One day I was in search of a lasagna recipe that didn’t have ricotta or cottage cheese. 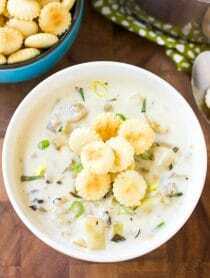 I stumbled across this recipe and I was super exited! I made it that night and it has been my go to lasagna recipe ever since. I absolutely love the combination of cheeses with the Italian sausage. Just a few days ago I made two pans of lasagna for my family for Christmas, all ages loved it! I wanted to thank you for sharing the recipe and let you know how yummy and amazing we all think it is. Thanks much! Thanks so much Alexis. I’m glad your family enjoyed it! 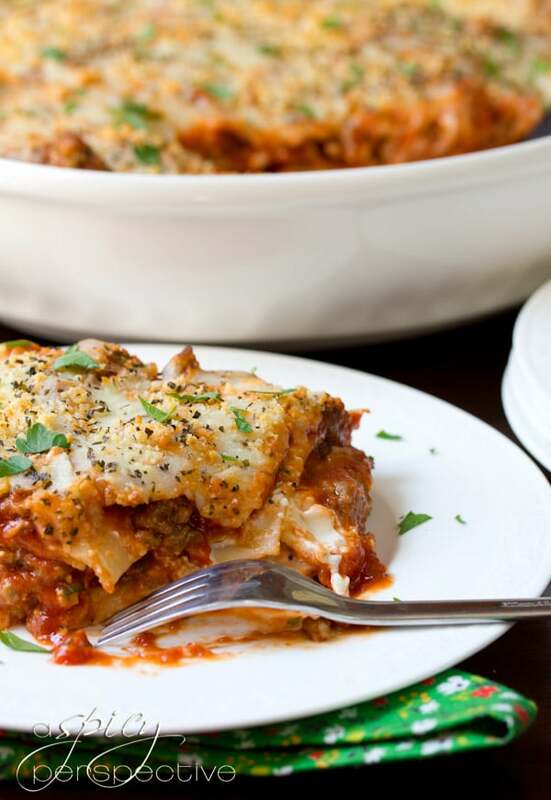 I made this recipe for my boys and they said it was the best lasagna they had ever tasted. I agree – it was outstanding. I diced green pepper and added it in to each layer. It added a nice crunch to the lasagna. Thanks for the recipe! Thanks Tim, so glad you liked it! I love this idea! I use sour cream in my baked ziti, so naturally cream cheese could only be better! Thanks Deb. So glad you like it! Just thought I would comment on cream cheese in lasagna from the perspective of someone who doesn’t really like cream cheese, other than on a bagel with smoked salmon. However, I like almost all other cheeses so the idea of using cream cheese instead of ricotta intrigued me and I decided I probably wouldn’t hate it. So over the weekend I made a simple lasagna based on your recipe, using a mix as sausage, ground beef and ground pork in a tomato base, and with one layer ricotta and another with cream cheese. Both cheese layers I sprinkled with shredded mozzarella and parmesan. The lasagna turned out pretty good. The cream cheese layer added a nice tang when eaten together with the other layers, but I did not like it as much on its own (you know how multi-layered lasagnas usually topple over…). It also still looked like cream cheese – like a processed cheese product, keeping all of its “wrinkles”, so that grossed me out a little. But that’s just me. Overall, glad I tried it, but not sure I would add the cream cheese again. I’ve made this several times since discovering it on this blog, the cream cheese always makes it delicious! Pingback: Lasagna Pizza. | bunkers down. What happened to your link to the homemade sauce? It was delicious! Hi Pam, Maybe it disappeared when my site was remodeled. I just added it back in! Do you think you can use the Italian seasoning for dressing on the top??? Can’t wait to try this! I made this for dinner last week and it was amazing. My boyfriend had one bite and declared it the best lasagna he’s ever had in his life. He liked it so much that he asked that we make this for Christmas dinner this year. Thanks for the great recipe! Oh my oh my! 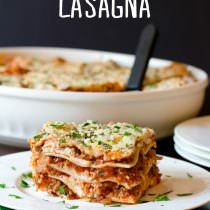 I pinned this about a week ago and my mother was craving lasagna so I told her I had a recipe for her to try and sure enough this is AMAZING! Like the best recipe ever! I will NEVER need a lasagna recipe ever again! Thank you so much for sharing and tell your MIL we women thank her! Do you REALLY mean two QUARTS of marinara sauce? It’s never occurred to me to put cream cheese in lasagne but it makes perfect sense! This looks so easy Sommer – I’d never think to use cream cheese either. I’m officially extending an invitation to come over for dinner…oh and can you bring this? WOW. Drooling. Wow, that was not a secret I was anticipating. Like you, I couldn’t imagine it without ricotta but from your high praise, I have to try it. Alexis is probably going to look at me crosseyed when I suggest it, ha ha. 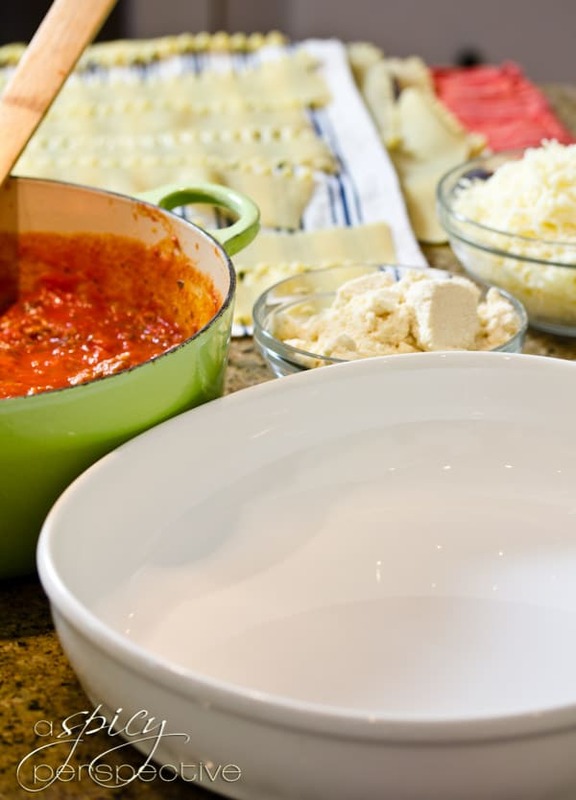 We have always, always used a mixture of cream cheese and ricotta in our lasagna and manicotti recipes. SO good! I need this for dinner! So trying this — yummo! What a delicious recipe! I simply adore lasagna but I always have a problem when I prepare it! I can stop eat them :). I could seriously eat this ENTIRE dish, even if the heartburn kills me. I think cream cheese makes total sense! I’ll have to give this a try. This looks so good. I thought it was crazy when I switched from ricotta to cottage cheese. Now I am going to try this! Mmm… That both looks and sounds delicious! Looks delicious. I think the cream cheese idea is a good one. I’m from Germany, and in Europe I don’t know a single person who makes Lasagna with ricotta cheese (including all my Italian friends). Everyone makes it with a bechamel sauce, which I love, but it’s extra time. So, cream cheese sounds like a quick and delicious option since it usually pairs well with tomato sauce stuff. I never would have thought of cream cheese, but I could DEFINITELY see how it’d be great in lasagna. The added tang probably gives it such a unique flavor. 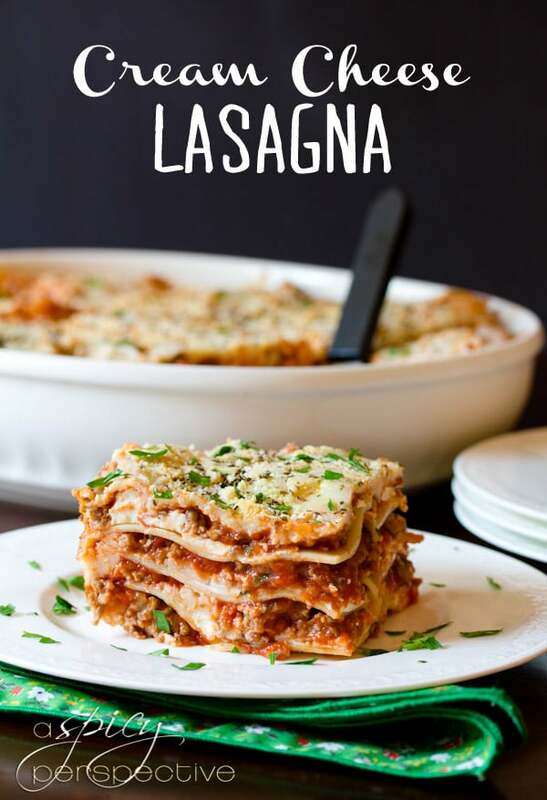 Lasagna has been one of my favorite meals since I was a kid and I’ll be trying your recipe next time lasagna’s on our menu! My seven year old was just begging for lasagna the other day. I love that you use cream cheese. I have used it with mozzarella and parmesan to fill ravioli but I never thought to try it in lasagna. I’m inspired! 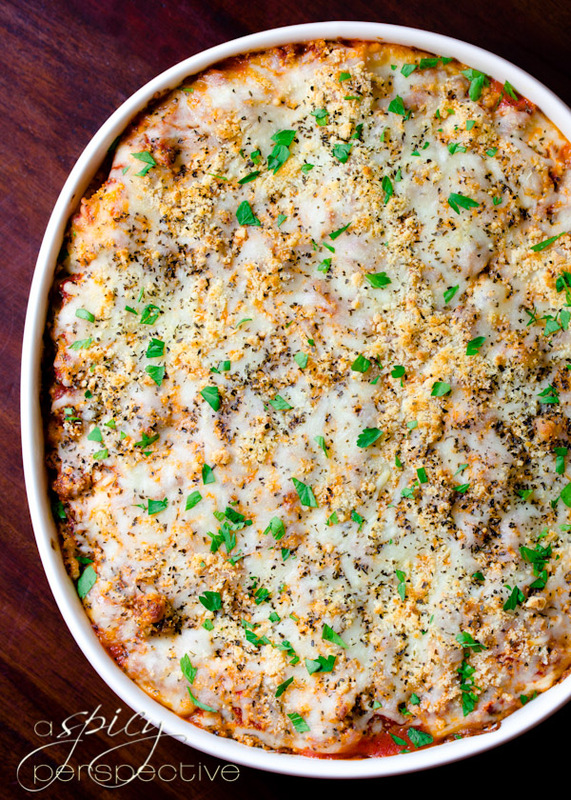 Your beautiful photos make me want to make this lasagna. It looks super juicy and delicious! What a cute newlywed story! Thanks for sharing it w us, Sommer. Cream cheese has a lot more flavour and a beautiful smooth texture. How interesting! I’ve never heard of cream cheese in lasagna, but I can almost imagine the silkiness that it must add. Gotta give this a try! My Italian grandmother is rolling in her grave. But I totally want to try it! Do you use full fat cream cheese or is the 1/3 less fat kind an ok substitute? I know from experience that sometimes it’s ok to substitute, but sometimes it’s not so just wondering if you tried it! Love those perfect layers, so pretty. I am so trying cream cheese in my lasagne! YUM! I bet that gave it a great creamy taste and a little zip, too. I always found ricotta to be a bit bland. Great recipe! You can’t really beat homemade lasagna, can you?? Love this idea, it looks so good girl – now I have a craving for it. My sil puts cream cheese in her lasagna too, so I throw some in occasionally! it’s makes it so creamy and rich! 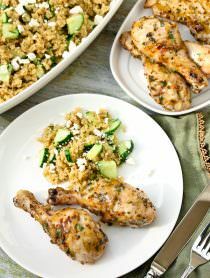 GREAT recipe and beautiful pictures Sommer! I’ve never tried cream cheese in lasagna but what a fab idea! I adore cream cheese in lasagna…I am just not a fan of ricotta or cottage cheese (at all) so I refuse to put either in lasagna. But cream cheese, totally on board. Love this Sommer! I cannot wait to try this. It looks amazing! Such a tempting lasagna! Love the sausage + cream cheese in there! This looks delicious. And, may i just say your blog is amazing and your pictures are wonderful. Yum! 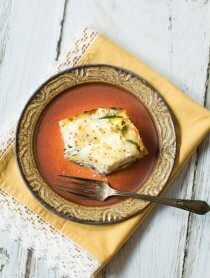 We use cottage cheese instead of ricotta…can’t wait to try this! OH YUM!! This sounds insanely good! My favorite baked ziti recipe calls for sour cream in place of the ricotta. Cream cheese is the next logical step … yum! Love your lasagna photos; nice job! Lasagna is my nemesis when it comes to photographing it. I love this recipe! Totally pinning! Cream cheese in lasagna?! Now THAT is one I’ve never heard of before! But I can see how it would be SO good! pinning this for next week – i’m intrigued by the cream cheese! although none of your recipes have ever let me down, so i’m sure it’s going to be life-changing! Oh wow this looks amazing! My husband is going to want me to make this ASAP. I could eat lasagna every day and be a happy camper! covered or uncovered at that point? Hi Pat! Bake at 375 for 40-50 minutes. Only covered if you feeling the cheese is starting to get too crisp. Happy Cooking! OMG..Cream Cheese that is totally brilliant!!!! This looks amazing, Sommer! Perfect for these chilly fall days. I love lasagna, but the funny thing is that I have never made it outside of my parents house. I must associate it with being with my family. This looks lovely! I am a firefighter, and we make this at work all the time… it is amazingly good! They always make it with ‘firehouse bread’, which is garlic bread with ranch dressing on top, then tomato slices and cheese. :) Not great for your waistline but soo worth it!